Reblogged this on Navigating By Joy. My son has verbal processing problems, diagnosed at 7 when the educational speech therapist found he had a vocab of someone off the chart (it went up to age 13). Problem was his brain wasn’t developed enough to do anything with all these words, leading to a word finding problem. This is shown in his written work, which he finds very labourious, as he is unable to hold what he wants to write in his head long enough to write it!. I’m told it will improve with age, and it has, but it’s still horrible watching your child struggle. It sounds like you’ve got it well sorted though! Thanks Claire, it’s always comforting to know other people are blessed with interesting challenges too! Thank goodness for home education, eh? Thank you, thank you, thank you for this post! I haven’t heard of any of the resources you list and am so excited to check them out. WOW! Just WOW! Thank you for this post. So much!! We have homeschooled since birth, have only 1 child (so no direct comparisons available however much that would help), and my son has had the worst time imaginable trying to learn to write. Even with the aid of the internet – and my compulsion for looking up everything – I never found this information – or anything from the UK at any rate! My son is 14, cannot write a word but can literally eat his way through a mountain of books. He never draws, paints or any of that stuff. Even airfix he messes up – but because he likes it, he does it anyway. We booked an assessment with an E.P. about 2 months ago and we finally see them in 2 days 🙂 Its 3 hours long and its a full test of everything – ASD, Dyslexia, psychometric and the obvious dysgraphia. I am so glad to read this post and I am very thank ful with the links you post too. I am so happy that you have the knowledge behind you at 7 years old. My son always had a problem with handwiriting, and I got him to copy things out from books etc, but as he has spent the last 3 years at online school and done well, it wasnt until december we realised that he has not improved at all! The online school was great, but there was no writing at all… he has gone backwards if anything. So thank you, and I am glad to hear that I am most likely on the right path with the Ed.Psych. I have been worried about the amount of money and hence I am googling is it worth it! It sounds like you’ve been a wonderful support to your son. It can be so hard finding information, can’t it? When I come across anything that resonates with our experience I often find myself moved to tears, I’m so grateful! And yes, it’s a financial commitment, isn’t it! I really hope your son’s assessment (today?) went well and that the feedback is as useful as ours was (though I still wonder about high-functioning autism…). I suppose that, at least, dysgraphia is less of a life-problem these days than it ever was before. I love writing but I think the only place I do it by hand is in my diary! I would love to hear how you get on. And thank you for the inspiration and support! ps so good to hear a Toe By Toe success story, too! I have a son, seven, entering second grade that I would like to home school again. He went to traditional school last year for first grade, I home schooled him for kindergarten. My son has dysgraphia. Any suggestions for curricula? 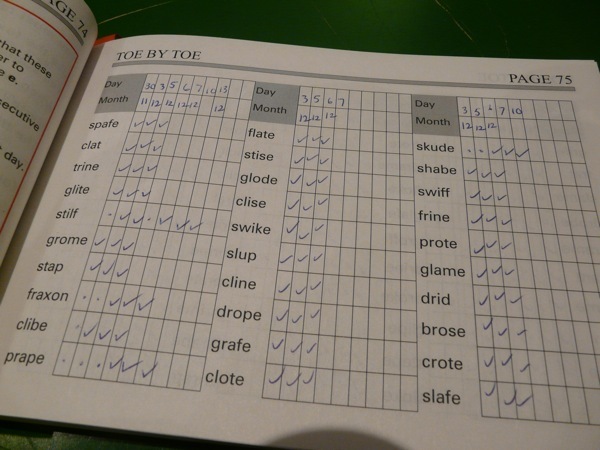 Oh and I also used Toe by Toe to actually teach my son to read! I was getting bored of Peter and Jane and he seemed to struggle and I wondered if he was dyslexic. I found this book by accident and it is FABULOUS! Presevere with it right to the end and you will be so impressed. 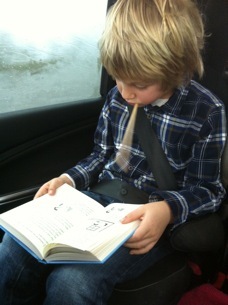 Even my husbands reading has improved! That’s so good to hear! And just what I needed, today. My son is a perfectionist and no matter how many times I explain that making mistakes is how we learn, emotions still run high every day when we do our 6 minutes of Toe By Toe! not wanting to hijack this as a chat feed – but thought I would share that we havent had the full report (about 4-5 weeks) but after todays assessment she told us that we had done a remarkable job as he has significant educational needs. He is completely dysgrahic, dyscalculaic and has the remnants of dyslexia… I told her that I had taught him to read with toe by toe and she was thrilled. She said that was why there must only be remnants left. The areas he had issues were with the polynons – so that might be an area you want to pay attention to, as she said those were often the weakest and hardest parts for dyslexics. She also said that he had a SPD (shaving and hair brushing an obvious problem) but that these could be help with occupational health and a specialist optician who deals with spatial things where he was lacking. I was a bit bowled over to be honest. She told us he will never write well, so not to worry about it as I had been worrying about him taking exams in 2 years. She told us he qualifies for extra time, scribe and also using a laptop in GCSE exams etc. Hi, I’m so glad you came back to say how things went. It’s great to connect with someone who’s going through similar stuff to us! We don’t know anyone in “real life” (funny expression) in the same boat. Perhaps I could write about it on this blog to encourage more people to share their experiences. I completely know what you mean about seeing the Ed Psych being a positive experience. When you are already all-too-aware of what the problems are, diagnosis doesn’t make anything worse. Instead, as you say, it gives you the tools to start finding solutions. Your son must be so pleased. As must you, as regards exam accommodations etc. The Ed Psych advised us to bring J(8) back in a few years to check his progress and his probably entitlement to similar accommodations. That’s interesting about the polynons in Toe By Toe. My heart sinks when we get to a page full of them because emotions run so high when my son gets them wrong, but I can see that by the end of a page he really has learned something. So encouraging to hear your son has overcome his! Thanks again for coming back. I’m sure this conversation will help other people who land on this page so feel free to come back anytime. You really described my son except that he does not read quickly. I really like your blog. Does Toe by Toe really work that well? We are using the Barton Reading and Spelling program but it is slow going which is fine – I don’t mind taking our time. The Toe by Toe just seems too good to be true since we have struggled for so long (my son will soon be 8). I’m with you about there being no rush. As long as we’re working regularly on J(8)’s reading and writing skills, I know we’ll get there in the end! Our boys are young – there’s plenty of time. And there are always audiobooks and reading aloud! The educational psychologist said our son had the remnants of dyslexia – at 14 yrs old- and we did toe by toe when he was 8 ish. It made a remarkable difference and infact made him able to read for the first time ever. I am revisiting it and going through it again because of this. Also for Lula, try out http://www.wizardsspell.com as this is excellent.. Yeah you have to get used to it, and get a feel for it, but you can give graded lists to your kid and also get them to remember the spellings well. It’s meant that his spelling is near normal – practically alien for a dysgraphia/dyslexic child. Thank you so much, Claire – I really appreciate your encouragement. We’ve got a page of polynons coming up which my son finds really challenging but I know it will be worth it. You must be so pleased that you intuitively used the right tools with your son. I shall check out wizardsspell – thank you! Toe to Toe sounds really interesting. I hadn’t heard of this system at all. I will look into it. Even if I don’t end up using it (we started with Barton last year), I have many friends with dyslexic children that might find it a better fit. I found out last year that both my daughter (then 5th grade) and my son (then 2nd grade) are dyslexic. One is also dyscalculic and the other is also dysgraphic (stealth dysgraphic) and ADHD and has an auditory processing issue. I agree that while assessments sound terrible when you just hear the difficulties, they are actually tremendously helpful in finally explaining all the things you suspect as a parent but can’t really prove. It also gives you (if done correctly) a thorough, in-depth jumping off point to guide you on what to do next. I am so grateful for our evaluations! They were worth every penny! To be honest, I didn’t even know there WAS stealth dysgraphia. My son could form his letters just fine. He wrote a bit slower than other children, but very accurately, so we had no idea there was any issue. When he hit 2nd grade, he was really struggling to copy anything from the chalk board into his daily notebook. The teacher would get really frustrated and angry with him and he had no idea what was wrong. He became very discouraged and depressed. In fact, he became so traumatized by his experience in 2nd grade that his hands would start to shake when he heard a pencil cross paper or he had to write anything. We eventually pulled him out of school. Getting a detailed evaluation coupled with our own in depth research produced so many answers. We were grateful. Finally we had an explanation and it was such a relief. In the lower grades he was explicitly taught how to form letters and write on the large line tablet paper with the middle dotted line as guide for the lower case letters. This explicit instruction allowed him to learn how to write. He can write quite well on that type of paper. His issue (his dysgraphia) is that he CANNOT adapt that knowledge to other sizes of letters or correct spacing for smaller lines or onto blank paper with no lines. We were told that he will probably have to again be taught explicitly on each type of paper and for various sizes of lettering. It has been a slow process since almost no one knows anything about stealth dysgraphia and even the few that do really didn’t have a suggestion as to how to accomplish this without burning us both out completely on handwriting. Has anyone else heard of this issue? For language arts both kids are doing Barton. I wanted to mention that just recently I administered two criterion referenced spelling tests to my older child (further along in the program) and although I did not allow her to see the list of words ahead of time and she spelled them “cold”, she got every word correct. In 5th grade she had trouble even spelling simple words and frequently got single digit scores on spelling tests. She can now self-correct a tremendous number of words as she writes them. She understands the rules behind WHY they are spelled the way they are and can reason it out. I loved language arts in school and always had good grades and even I am learning from this program. Reading is coming along, too, although not as quickly as spelling. It sounds like Toe to Toe is a great program, too. I am so grateful that there ARE programs for dyslexics that can be taught by parents. We tried tutoring with a CALT specialist and one month and $800 later the kids hated every minute of it and hadn’t made ANY progress. Doing it myself has been so much more successful (and cheaper in the long run). I am trying to find a handwriting program to teach my son cursive. He is going into 4th grade and doesn’t want something “babyish” but his assessor pointed out that he functions way above grade level when presented with something in color and way below grade level if it is in black and white (another thing I had no idea made a difference). Most things with lots of color are for very young students. I was told that cursive may be easier for him to learn, but I don’t have a clue what program to start him on. Any suggestions? Thank you so much for your contribution to this conversation! It can be so difficult to find good information about these issues, and other parents’ experiences are so useful to hear about. 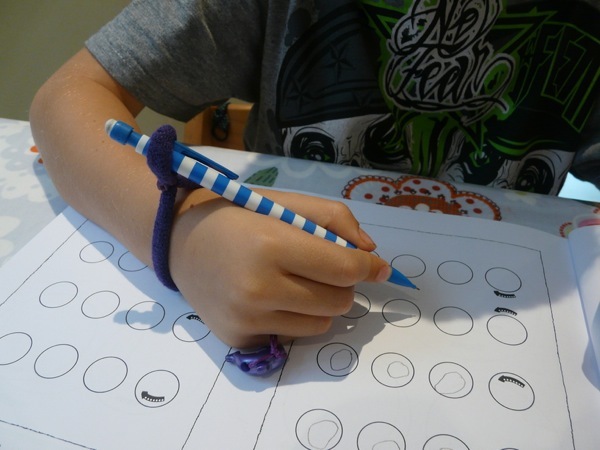 I am fascinated to read about stealth dysgraphia. Thank you for describing it in such detail. The Dyslexic Advantage got me so excited about what’s possible for these children with their extraordinary brains. I’m going to look at the Barton program. J(8) is making good progress with Toe By Toe but he does find it frustrating to the point of tears sometimes (not a good learning state!). Very interesting about the difference colour makes. J(8) was using Handwriting Without Tears to learn cursive but that is black and white. We’ve actually stopped with that for the moment though and are sticking with copywork for writing practice. He’s still young so I’ve decided to take the pressure off for a while. It will be interesting to hear if anyone has any suggestion for a cursive program for when he is a bit older. And thank you for the great site! I love Navigating By Joy! It helps so much to connect with other parents trying so hard to help their kids and not always knowing where to go. Your effort to spread knowledge and encouragement is greatly appreciated. Thank you, again! I have just come across this blog (dated Dec 2012) and read about your encouraging progress with Toe by Toe after a few months of 6 minutes a day. I’m wondering how things have progressed since…? Would it be possible for you to give us an update? Thanks in advance and congrats on Jasper’s success. Hi, Thank you for reading and commenting on my post, and for your congrats. We used Toe by Toe for about a year in total before Jasper asked to stop. By that point I could see that his reading had improved considerably so (in accordance with our unschooling philosophy) I agreed. Jasper (now 11) still doesn’t read long books for pleasure (he prefers audiobooks), however he does enjoy reading all the tween boy series (eg Wimpy Kid, Denis the Menace), illustrated non-fiction picture books, comic books and computer games (extensively!). When I read your comment to Jasper, he said that he definitely thought Toe by Toe helped a lot ‘with the basics’, for both reading and spelling. So thank you to the Toe by Toe team! I will aim to write an updated post which I’ll link to from this one. Thanks for getting back to me Lucinda. We’re happy to hear that Jasper reads independently. It doesn’t matter what he reads at the moment, practice in decoding should enable him to move on to Harry Potter etc if and when he is ready. Thank you – that’s very encouraging to hear! I am wondering if you have any recommendations for curriculum for 7th grade. My twin sons are 12, and in 6th grade this year. They are on track to complete the Barton Reading System for dyslexia in May!! They have mild dyslexia, dysgraphia and dyscalculia, and one has other language deficits. Their intelligence is above average, but they become frustrated easily and I don’t want to choose something for next year that will exhaust them. I also have a daughter with similar challenges, who will be in 5th grade next year. I am eager to learn what your suggestions are! I can thoroughly recommend the above book that Frank Cowling suggested. His book taught my son to read. It’s expensive, but worth more than pure gold in my eyes! When I think of all the money I wasted on this and that trying different techniques, I wish I’d found this first. I stumbled on it by accident, and as I was at my wits end, I gave it a try. Best thing I ever did. My son is 18 now, reads perfectly although slowly, and holds down a regular and well paid job with minimal difficulties thanks to this book alone in my opinion. Jen, Congratulations to your sons on completing the Barton Reading System! That is awesome. I can definitely relate to what you say about them becoming easily frustrated and exhausted! I’ve just written a post about what my son’s using this year (his 6th grade year too). 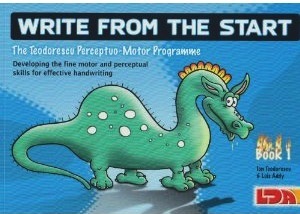 Nessy is his favourite regular resource to help with his reading and writing. He uses Nessy Fingers for touch typing (also helps spelling and reading) and Nessy Writing Beach. Both are quite gamified which keeps Jasper engaged, but he also learns heaps. Have your children tried Nessy? You might also be interested in some of my posts on my blog about raising twice-exceptional children. Here are some posts I’ve written over there about learning. Thank you for reading my post and commenting. I’m sorry I took so long to reply!